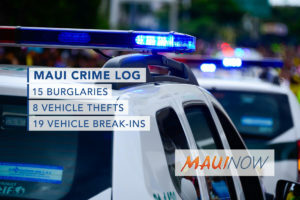 Maui police responded to 17 burglaries, 9 vehicle thefts and 17 vehicle break-ins in Maui County over a seven day period from Sept 16-22, 2018. Burglaries decreased 5.5% from the week before when 18 incidents were reported over the seven day period. Vehicle thefts were up 28.5% from the week before when 7 incidents were reported; and vehicle break-ins increased 54.5% from the week before when 11 incidents were reported. Sunday, Sept. 16, 11:59 a.m.: 400 block of Kukuna Rd, Haʻikū, residential, forced entry. Wednesday, Sept. 19, 3:58 p.m.: 4400 block of Opana Pl Haʻikū, residential, unlawful entry. Saturday, Sept. 22, 11:08 a.m.: 15 Hoʻokele St, Kahului at Zippys, , non-residential, unlawful entry. Tuesday, Sept. 18, 10:51 a.m.: 2400 block of S Kīhei Rd, Kīhei, residential, unlawful entry. Thursday, Sept. 20, 7:21 p.m.: 100 block of N Kīhei Rd, Kīhei, residential, unlawful entry. Wednesday, Sept. 19, 10:24 a.m.: 3700 block of L Kula Rd, Kula, residential, unlawful entry. Sunday, Sept. 16, 5:25 p.m.: 200 block of Puapihi St, Lahaina, residential, forced entry. Saturday, Sept. 22, 8:55 a.m.: 1000 block of Olapa St, Lānaʻi, residential, unlawful entry. Sunday, Sept. 16, 5 p.m.: 900 block of Paipala Pl, Makawao, residential, unlawful entry. Saturday, Sept. 22, 7:54 a.m.: 1100 block of Aʻala Pl, Makawao, residential, unlawful entry. 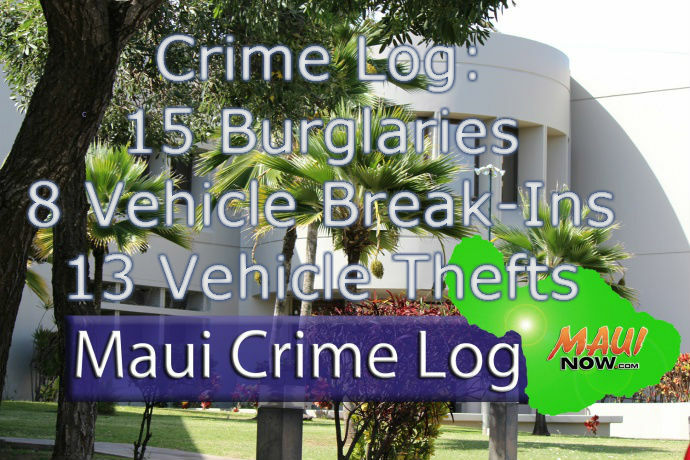 Sunday, Sept. 16, 7:13 a.m.: 30 Oki Pl, Kaunakakai, Molokaʻi at MKK Community Health Center, non-residential, forced entry. Monday, Sept. 17, 11:20 a.m.: 30 Oki Pl, Kaunakakai, Molokaʻi at MKK Community Health Center, non-residential, forced entry. Tuesday, Sept. 18, 7:01 a.m.: 754 Maunaloa Hwy, Kaunakakai, Molokaʻi at Kingdom Hall of Jehovah Witness, non-residential, forced entry. Tuesday, Sept. 18, 2:59 p.m.: 1215 Kamehameha V Hwy, Kaunakakai, Molokaʻi, non-residential, unlawful entry. Sunday, Sept. 16, 9:21 p.m.: 3800 block of L Honoapiʻilani Rd, Nāpili, residential, forced entry. Sunday, Sept. 16, 9:06 p.m.: 200 block of Muliwai Dr, Wailuku, residential, unlawful entry. 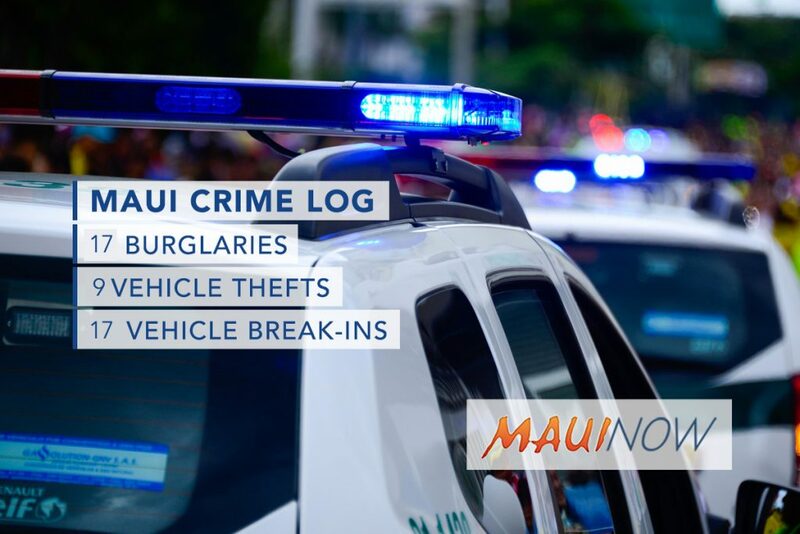 Thursday, Sept. 20, 9:04 a.m.: 2100 block of Mokuhau Rd, Wailuku, residential, unlawful entry. 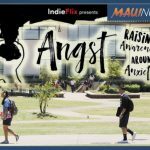 Monday, Sept. 17, 7:34 a.m.: 2830 Hāna Hwy, Haʻikū at Haʻikū Community Center. ECC934 1991 Infiniti G20, white. Sunday, Sept. 16, 10:21 p.m.: 3350 L Honoapiʻilani Rd, Kāʻanapali at Times Supermarket Honokōwai. LHM881 2009 Infiniti FX35, copper. Monday, Sept. 17, 9:26 a.m.: 884 W Mokuea Pl, Kahului at Avis Rent-a-car. LHV388 2018 GMC Acadi, gray. Sunday, Sept. 16, 7:02 a.m.: 1-100 Kihalani Pl, Kīhei. MKY472 2000 Honda Civic, black. Tuesday, Sept. 18, 11:37 a.m.: 2400 block of S Kīhei Rd, Kīhei. MYM124 1992 Honda Accord, white. Tuesday, Sept. 18, 2:14 p.m.: S Kīhei Rd and Uwapo Rd, Kīhei on mauka shoulder of S Kīhei Rd. HVN745 1993 Toyota Corolla, blue/green. Friday, Sept. 21, 7:43 a.m.: 2100 block of S Kīhei RD Kīhei. MXB158 1990 Honda Accord, blue. Thursday, Sept. 20, 6:19 a.m.: 2000 block of Holowai Pl, Wailuku. FYX296 1994 Honda Accord, red. Friday, Sept. 21, 4:41 p.m.: 1770 Mill St, Wailuku at Tasty Crust. MYF156 1992 Toyota Tercel, blue. 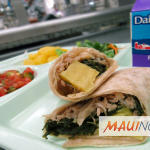 Tuesday, Sept. 18, 3:04 p.m.: 810 Kokomo Rd, Haʻikū at Aloha ʻĀina Center. 2005 Honda Pilot, blue. Friday, Sept. 21, 1:40 p.m.: 10200 Hāna Hwy, Haʻikū at Twin Falls. 2017 Jeep Wrangler, white. Wednesday, Sept. 19, 7:10 a.m.: 2481 Kāʻanapali Pkwy Kāʻanapali at the Whaler on Kāʻanapali Beach. 2016 Ford Escape, white. Wednesday, Sept. 19, 7:10 a.m.: 2481 Kāʻanapali Pkwy Kāʻanapali at the Whaler on Kāʻanapali Beach. 1996 Honda Accord, silver. Sunday, Sept. 16, 1:45 p.m.: 59 Hoʻokele St, Kahului at Kahului Auto Sales. 2008 Ford Ranger, white. Sunday, Sept. 16, 2:34 p.m.: 59 Hoʻokele St, Kahului at Kahului Auto Sales. 2012 Honda Civic, gray. Sunday, Sept. 16, 4:24 p.m.: 214 Hoʻokele St, Kahului at Lowes Hoʻokele parking lot. 2014 Chevy Traverse, white. Wednesday, Sept. 19, 12:21 p.m.: 65 Kaʻahumanu Ave, Kahului at Asian Cuisine. 2013 Hyundai Elantra, gold. Sunday, Sept. 16, 7:34 p.m.: 2700 block of Kauhale St, Kīhei. 2011 Kia Soul, black. Tuesday, Sept. 18, 5:17 p.m.: 2400 S Kīhei Rd, Kīhei at Kamaʻole Beach Park I. 2017 Dodge Grand Caravan, white. Monday, Sept. 17, 8:28 a.m.: 283 Wili Kō Pl, Lahaina at Juans Auto Repair. 2001 Ford Ranger, white. Monday, Sept. 17, 8:28 a.m.: 283 Wili Kō Pl, Lahaina at Juans Auto Repair. 2002 Hyundai Elantra, green. Monday, Sept. 17, 10:18 p.m.: 1221 Honoapiʻilani Hwy, Lahaina at Lahaina Cannery Mall. 1993 Toyota pickup, green. Tuesday, Sept. 18, 7:36 p.m.: 1-100 Kīʻohuʻohu Ln, Nāpili. 2015 Subaru Forester, white. Saturday, Sept. 22, 10:08 p.m.: 134 Makawao Ave, Pukalani. 2016 Acura TLX, gray. Friday, Sept. 21, 5:26 p.m.: 3572 Wailea Alanui Dr, Wailea at Ulua Beach. 2017 Hyundai Sonata, silver. Friday, Sept. 21, 12:17 a.m.: ʻĪao Valley State Park Rd, Wailuku. 2018 Hyundai Elantra, blue.